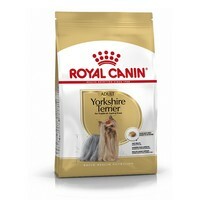 Royal Canin Canine Adult Dog Yorkshire Terrier has been specially formulated to cater for the needs of the Yorkshire Terrier breed over 10 months old. The unique formula targets the breeds hair to promote softness, colour and a healthy sheen. Tartar reduction formula also helps reduce tartar formation for improved dental health.